Mutton roast is an excellent dish which can be served as a starter or appetizer. It is very simple & easy to make at home. It tastes absolutely delicious and makes an irresistable side dish for chapathi, dosa, roti, naan or biryani. It makes a great sunday recipe for whole family. 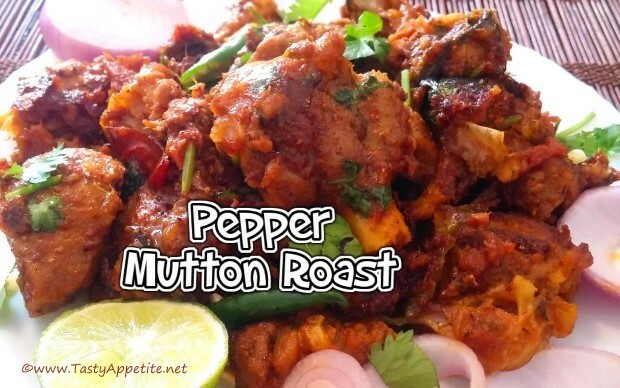 Learn how to make mutton pepper roast in Indian style with this quick video recipe. Clean and wash the mutton, drain water thoroughly. Add turmeric pwd, red chilly pwd, green chilly, mint leaves, coriander leaves, salt and mix. Pressure cook for 4 whistles in high flame and simmer flame for 10 mins. You can see the mutton is cooked soft and tender. Drain water (mutton broth) from the cooked mutton and keep aside. Add sliced onions and saute till transculent. Add tomato slices and cook till soft. Add turmeric pwd, red chilly pwd, coriander pwd, saunf pwd, cumin pwd, salt and stir. Add mutton broth and allow to boil. Now add the cooked mutton and combine with the thick masala. Keep the flame low and roast for 5 mins. Sprinkle freshly grounded pepper pwd, garam masala pwd and combine. Lipsmacking delicious mutton pepper roast is ready. Serve hot with parotta, naan, biryani, roti, etc.